There’s only one week before Expedition 376 ends, and I finally saw it! I was FINALLY on shift when the moon pool was opened to lower the re-entry system in! I saw the hole in the bottom of the ship! Normally, “hole in the bottom of the ship” would be cause for alarm, but not here on the JR. The technical term for the opening through which the drilling gear is lowered is moon pool, and it opens to ~7 meters/23 feet when needed. Upon hearing this, the next question is often, “why doesn’t the ship fill with water and sink?” To fully answer that, you need to know the concepts of buoyancy and displacement first. First, why do ships float in the first place? Watch this video from SciShow Kids to get a simple answer with illustrations here. Another good site to examine buoyancy and quiz yourself (or your students!) is at this site from PBS NOVA. Now that you know why ships don’t sink, it’s time to consider the moon pool- a large opening in the bottom of the ship that you’d think would allow water to rush onto the ship, decreasing our buoyancy until we sink, but obviously that doesn’t happen (thank goodness!). So what gives? The moon pool is designed so that the sides of it extend up into the ship, well above the water line. We keep the moon pool shut in rough seas and when we are in transit, so that way water does not have the chance to enter places it’s not supposed to be. 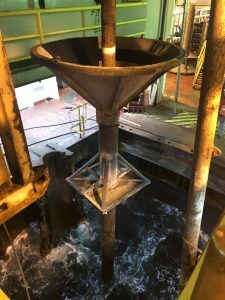 So, back to the JR. Tonight, after a few days of WoW-ing (waiting on weather), the swell had diminished enough that we could safely resume operations, and the first thing we needed to do was lower the re-entry system to our new drill site. Re-entry system preparing to be lowered through the moon pool. It seems as though every time we’ve put a re-entry system in, it’s been during the day shift, so I’ve always missed it because I’m tucked in bed. But not tonight! I could see the glow of the welding equipment from my office window as the drill crew were attaching the two halves of the cone together, and when I noticed the glow had stopped, I knew it was time for me to head to the moon pool viewing area (with my hard hat & safety glasses on) because this would most likely be my last chance to witness the process. I got there with plenty of time to observe the doors of the moon pool opening up to reveal the waves below, and then watched the system slowly push down into the water. Eventually, it will come to a rest at ~1300-1400 meters below the surface and we can then begin drilling operations at this spot. Hello there! My name is Tammy Orilio and I am sailing on board the JOIDES Resolution, Expedition 376: Brothers Arc Flux as an Education & Outreach Officer. I look forward to sharing both science and shipboard life with you! In my other life, I teach Marine Science and Advanced Placement Environmental Science at Marjory Stoneman Douglas High School in Parkland, FL. I love being able to share these experiences with my school community!